Richard Garneau, Resolute’s and chief executive officer, is the proud recipient of the John Dobson Medal for Free Enterprise – for a lifetime of principled leadership and advocacy on behalf of Canada’s forest products industry. The Dobson Medal is presented annually by the Montreal Economic Institute (MEI) in recognition of a career spent defending free markets and entrepreneurship. John Dobson was himself a principled leader and renowned Canadian investor who started the Formula Growth Fund. His John Dobson Foundation, established in 1986, supports entrepreneurial studies programs at McGill University and more than a dozen other universities across Canada. To learn more about Resolute, click here to view our latest annual report. 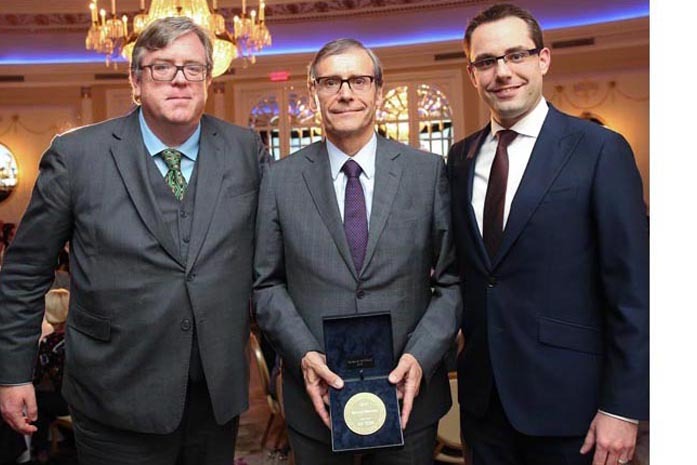 From left to right: Michel Kelly-Gagnon, president and ceo of the Montreal Economic Institute, Richard Garneau, president and ceo of Resolute and Azi Kiriazidis, president of the John Dobson Foundation.